I’d much rather shoot a .22 for fun just because of the recoil factor. A 30.06 packs enough of a wallop to bruise me if I fire it enough. Does the AR-15 pack as much punch? From Jenn. Another great question and I have to say that I am really enjoying this little series. It gives me a chance to talk about something I love and hopefully answer those questions you are dying to know. I will admit that I have never fired anything that takes a 30.06. However, one time I did fire my husbands .308 rifle. I literally fired one shot, said a couple expletives and handed it back to him. Kick like a mule much? I bruised and my poor shoulder was not happy with me for a couple of days. As Jenn already mentioned, a .22 is a lot of fun, has just about zero recoil, is typically a lighter gun over all, and the price of ammo makes them great for shooting large amount of rounds. The recoil from an AR15 in .223/5.56 has about the same punch as a .22. OK, not really but it is not bad at all! 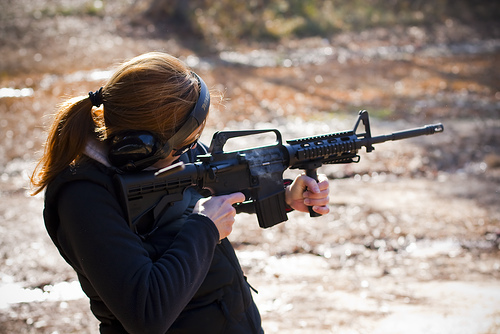 The majority of any aches and pains from shooting an AR is from position of shooting rather than the recoil. Obviously, standing and holding the rifle is going to be more physically taxing than sitting with a rest or shooting prone. But I am happy to say that I have never in my life been bruised from shooting an AR15 in .223/5.56. So give it a try and have fun. You will love it!